My not-so-secret love affair with toy pianos began about five years ago, when I picked up a used 37-key Schoenhut off Craigslist. Soon after, I formed the Toronto-based composer collective the Toy Piano Composers, with the toy piano as a symbol for the group, and often a featured instrument. Since then, the toy piano has been quite intertwined in many of my creative projects, and has been the inspiration for pieces like the two toy piano duet Chess Suite, a central character in the chamber work Girl before a Mirror, part of the electronics in it plays (because it plays), and now as part of this project for toy piano and bicycle bells. 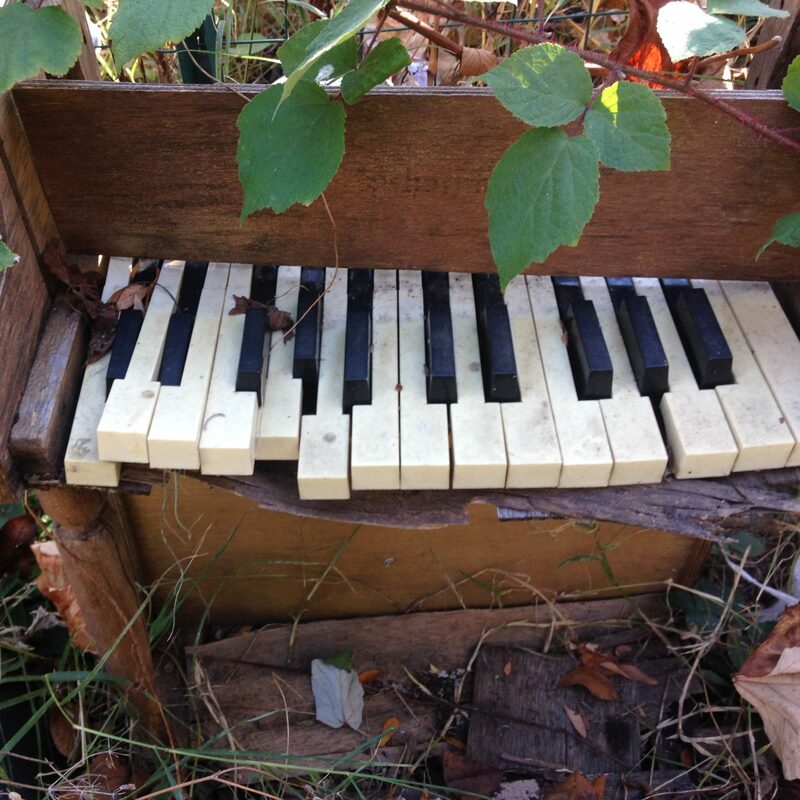 Having followed the UnCaged Toy Piano Festival (from afar) for several years, my interest was piqued this year when I saw the call for “music for toy piano and unconventional instrument”. When I started formulating my ideas, I kept circling around the idea of bicycle bells, and the kind of crazy timbral palette they could create in combination with the toy piano. But, are they unconventional? Debatable – they have certainly been used amply in new music. What attracted me to the bicycle bells, in addition to the vibrant timbral possibilities, was the “everyday” aspect: for many people, including myself as a biker, the sound of bicycle bells is part of their everyday sound world. Currently still in “rough draft” mode, I can let you in a bit on the process so far. My first step was to search for the right combination of bicycle bells, as I had decided early on I wanted to have set pitches for the piece (though I was flexible on what those set pitches would be). I also wanted to find a combination of ring bells (the classic bicycle bells with multiple rings – “ring-ring”), and ding bells (one high-pitched “ding”). I must have auditioned about twenty bells at various bike stores, toy stores, and department stores. I found three winners: two ring bells pitched at Ab and B (respectively), and one ding bell pitched at G.
The next and biggest issue was somewhat logistical: how could I affix these bells onto something so that they could be played by one hand only? I did not want a situation where both hands needed to be used to pick up the bell and play, because there was going to be quite a bit of back-and-forth between the toy piano and the bells. To make the physicality work, I decided the optimal way would be to have them on some kind of stand that could be positioned horizontally, to be on the same axis as the toy piano. Though it’s still to be determined how it will work for the performance, for the writing of the piece, I have affixed the bells to a mike stand, which is working very well. 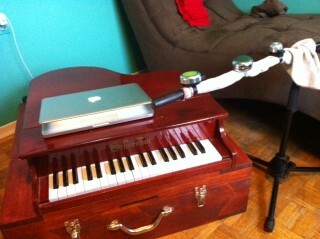 It could also easily work on a percussion stand. Once the piece is completed, I will ship these lovely bells off to Margaret and she’ll begin the next adventure – learning the piece.